Winter is upon us! Temperatures have dropped below freezing and the ground is now covered in snow and ice. According to Center for Disease Control and Prevention, about one million Americans are injured each year from slipping and falling on ice. Did you know that about one of three people, age 65 or older, will slip and fall each year on ice? Ice injuries are sometimes easily forgotten but they can result in a more serious injury than we think. There are ways that ice injuries can be avoided. 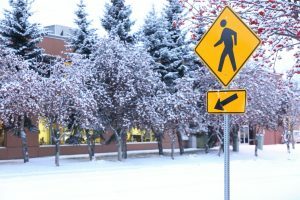 Be sure that appropriate footwear is being worn, which means wearing a heavy treaded shoe with a flat bottom or putting ice cleats on the bottom of the shoes. The right footwear can help prevent anyone from slipping and falling on flat ground. Another way is to stay aware of areas that appear like wet pavement — areas that could be ice. A third tip is to be cautious when walking under buildings, even homes, and watching for potentially falling snow or ice. Alaska’s long winters can also be hard on your body and mind. Regular exercise is the most common advice given by health care experts. Outdoor exercise is even better, because you can take advantage of winter sunshine. Taking care of your body also supports positive mental health. Make plans with family and friends, find activities and hobbies that make you happy, and take time to get a good night’s rest. Winter is a great time to share delicious meals with friends and family and learn a new craft. SCF offers many learning circles throughout the year which are a great place to do both. Be sure to check out SCF’s website where you can find the current list of learning circles, exercise class calendars, and community activities.